Why do parents buy chickenpox lollies? US authorities have warned parents that posting infected lollipops to other families who want their children to get chickenpox is against the law. But why are the parents doing it? The news that some parents have been apparently posting saliva-soaked tissues and licked lollipops to each other in an attempt to spread chickenpox among their children has been greeted with widespread condemnation. Doctors have cautioned that licking a supposedly infected lollipop is unlikely to pass on chickenpox - which is mostly an airborne virus - but could expose a child to other, more serious ailments. And Jerry Martin, US attorney for the Middle District of Tennessee, warned that anyone attempting to send so-called "pox packages" through the mail would be breaking federal laws against shipping biohazards across state lines. The Facebook page on which parents were discussing "pox packages" - Find a Pox Party In Your Area - has now ceased to exist. The idea of allowing your child to catch chickenpox - perhaps by taking them to pox parties - to avoid getting it in later life when it can be more serious, is not a new one. But the use of the postal service and social media represents a new phase. So why do parents do it? Meg, who until recently ran a Facebook page called Find a Pox Party Near You, told BBC News: "My son had a life threatening reaction to his vaccinations. He developed chronic encephalitis, seizures and a 105.7-degree temperature. He was never the same after those vaccinations. "Our children's doctor advised me to never vaccinate my other children because I would run a high risk of them having the same kind of reaction." She said she had been forced to shut down her page after the backlash over the lollipop story, even though she had carried a prominent warning against sending pox packages through the mail "because we have known that it has been going on for years". She intends to continue facilitating "pox parties" away from the glare of the media, after compiling a database of interested parents. 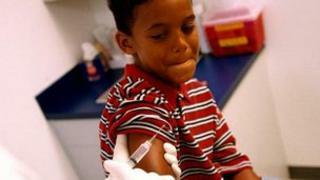 In the US, unlike in the UK, children are vaccinated against chickenpox. It is one of nearly a dozen inoculations that American youngsters must undergo - exemptions apart - by the time they reach the age of six. That's twice as many as their counterparts in the UK, where public concern over childhood vaccines has largely died down after the work of Dr Andrew Wakefield, linking the measles, mumps and rubella (MMR) vaccine to autism, was discredited. Dr Wakefield was struck off the medical register by the General Medical Council last year after it found him guilty of serious professional misconduct over the way he carried out his research. It is a different story in the US, however, where a celebrity-driven campaign against vaccines has kept the issue in the public eye. Movie action hero Chuck Norris is the latest well-known name to weigh in to the debate, in an article for a conservative website. Some parents object to what they see as the dictatorial nature of the US vaccine programme, which, they argue, leaves them little choice over what is being put into their children's bodies. Campaigner Robert Schecter, who runs the Facebook group Proud Parents of Unvaccinated Children, claims the pharmaceutical industry is a key driving force behind the growth in childhood immunisation in the US. "By no means is it a conspiracy, but there are vested interests working together," he says. A self-styled libertarian, who ensured his own daughter did not receive any vaccinations, he dismisses public health officials as "paternalistic do-gooders" who "get satisfaction out of what they believe to be helping people" when in fact they are doing no such thing. Vaccination sceptics like Mr Schecter can produce reams of statistics which they claim show public health officials have exaggerated the seriousness of diseases and "covered-up" safety concerns. They even dismiss figures from the US Centre for Disease Control and Prevention that cases of measles tripled last year, pointing to the fact that were there still only 220 cases and no deaths. The disease is also on the rise in Europe, where there were 29,000 cases and nine deaths in the first seven months of 2011. "There is a very great deal of scepticism and questioning out there. Part of it comes from the very great success of vaccination programmes," says infectious diseases expert Dr William Shaffner, of Vanderbilt University School of Medicine, Nashville, Tennessee. "The current generation of young mothers have very little experience of disease. "Even the experience they have had of chickenpox has been with a much less severe form, with fewer complications. It is seen as a relatively transient illness not worthy of much respect." But, he argues, chickenpox and measles can both still be very serious diseases, particularly if there are complications. And he blames the Andrew Wakefield case for undermining public confidence in the US and the UK, even though it is a decade since the MMR scare hit the headlines. "It is impossible to unring a bell. There are still many people who believe that vaccines and, in particular, the measles vaccine, is linked to autism. "The whole controversy fuelled a general scepticism about vaccination and a belief that the 'the natural way is the best way'"
And he adds: "The internet plays a substantial role, particularly among upper middle class, young mothers, who are used, in their professional lives, to researching things on their computers. "Unfortunately, they can not always make a clear distinction between information and misinformation." The scientists who strived to develop vaccines to common diseases "would be aghast and scratching their heads as they attempted to understand how this extraordinary boon, which along with clean water is one of the most effective public health interventions of the 20th Century, could be denied," says Dr Shaffner. But, at the same time, he says he does have a "a great deal of sympathy and understanding" for vaccination-weary parents in the United States. "There is a debate about whether we have come to the limit of what we might call the pincushion effect on children, because there are a lot of jabs."